India has the best snacks, assuming that your tastes run more towards fat-bombs and spice and less towards freshness and health. One of our important goals for this trip was to leave knowing that we had eaten an adequate amount of Indian snacks. I think we can safely say that we fulfilled our mandate. The best/worst part of snacks is that they generally are sold/consumed either outside or in trains. When you are outside or on a train, you generally have filthy hands, and are in the public eye. Both excellent pre-conditions for consuming messy foods. Just go with it, T-bone. Let’s start with the familiar. Samosas are one of my favourite Indian snacks. They are comprised of a gram flour (chickpea flour) shell filled with a potato/chickpea/pea/spice/etc mixture. The resulting concoction is thrown in a vat of oil, and fried until it begs for mercy. A variation on the samoso theme is the kachori. Strangely enough, I had never tried one of these delights. It also has a potato-based filling, but the outer shell is made out of wheat flour rather than gram flour. Based on my limited experience, it seems to be fried even longer than samosas, and when it is removed from the oil, the kachori-walla gouges a hole in its center and fills it with spicy sauce. Dude. You forgot the hole. (The crater in the middle of the flavour volcano). 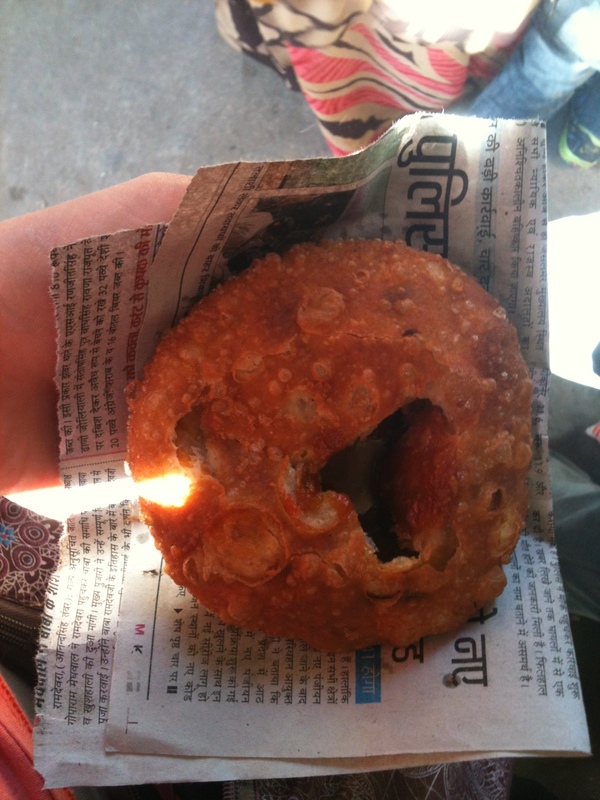 Todd made it his mission to eat chaats (savoury snacks) before we left India. We found a promising chaat-wallah outside the Amber Fort in Jaipur, and ordered a round. He tossed together a mixture of rice crisps, lemon, chilli, onion, tomato, deep fried gram flour crisps, deep fried lentils, peanuts, and salt. This really is the genius of Indian food – taking a set of unlikely ingredients and creating beautiful harmony. Enough with the savouries! On to the sweets. We consumed an embarrassing number of Indian sweets on the trip. Indian sweets are all generally based on the same few ingredients – milk, sugar, and spice (sounds a bit like chai…). These ingredients are then shaped into a variety of forms. My personal favourite is milk cake – a fudge-like dessert that tastes like buttery sunshine. It was really hard to make myself wait until after I’d snapped a photo to eat this beauty. And last and probably least, a good ol’ packet of Hide & Seek biscuits (“India’s finest molded chocolate chip cookie”) and chai. For times when you’ve ingested enough bacteria and want some processed/packaged fat and sugar. With all these amazing snacks, it was difficult to find enough space in our guts to hold actual meals. You will be relieved to know that we soldiered through this minor difficulty. The lassi is a simple drink, but like many things in life, sometimes simple is best. Basically, it is a glass of puréed yogurt. That isn’t a great description, though, because Indian yogurt (known as curd) is quite different from Western yogurt. In the words of my Thai friends: “same same but different.” It isn’t as smooth or uniform as western yogurt, and it has a mild, sweet’n’sour flavour. 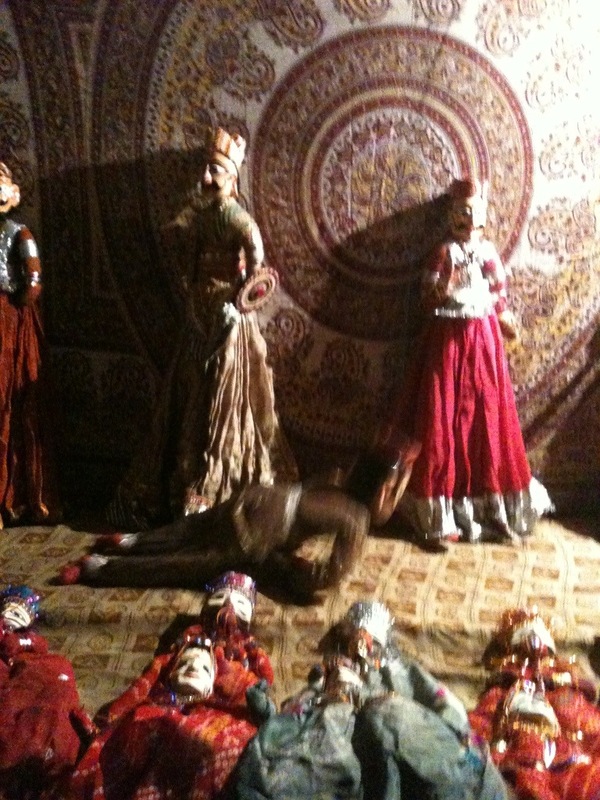 Our favourite lassis on the trip came from Lassiwalla in Jaipur. Lassiwalla is the top-ranked restaurant in Jaipur on Tripadvisor, and it’s not hard to see why. For 17 rupees (33 cents), you get a cup full of bliss. Ignore my grotty fingernail, and focus on the beauty in the cup. Lassiwalla is so popular that no fewer than three knock-offs have popped up next-door. One night when Lassiwalla was closed, we tried the neighbouring lassiwalla, and it was also quite good, though maybe not quite as epic. Same type of operation, but without the panache. Both lassi shops begin by filling a clay cup with puréed curd, and then adding a piece of firmer curd to the mix. They serve it to customers with a spoon. This is one happy customer. When you’re finished, you huck the clay cup in the trash receptacle (an unusual feature for India), and bob’s your uncle. On to round two. Magically, as soon as we left the polluted hole otherwise known as Jodhpur, our spirits revived almost immediately. Almost, because we first had to endure an eleven hour bus journey. Our hotel owner booked us on what can only be termed the “milk run,” and must have pocketed the change. The bus picked up and/or dropped off every man, woman, and child in Eastern Rajasthan. 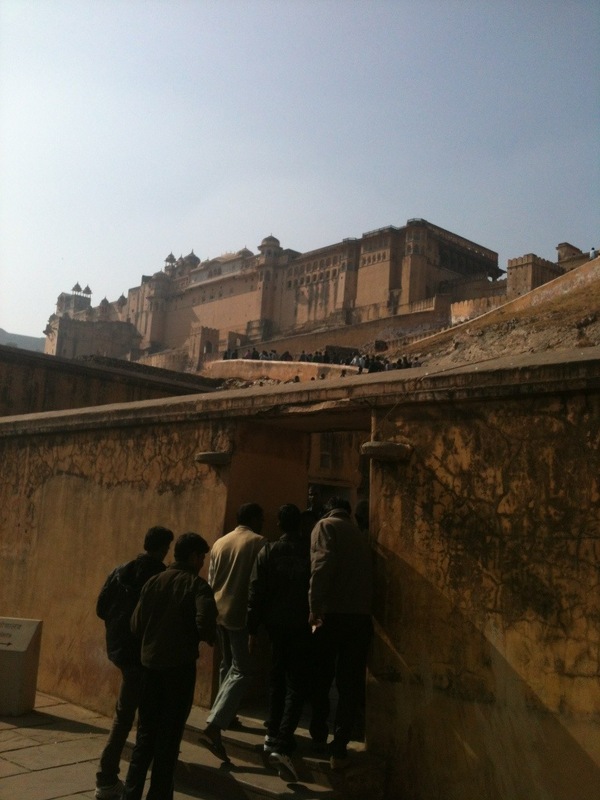 The Amber Fort, located just outside the city. It also offered some fun human/bovine/ puppet encounters. Tourist season is in full force, and massive swarms of Indian tourists were everywhere. There is a fun trend in India called “get your photo taken with a foreigner,” and everywhere we went, we were asked to pose. My favourite was when men wanted their photo taken with Todd, and insisted on holding his hand in the picture. 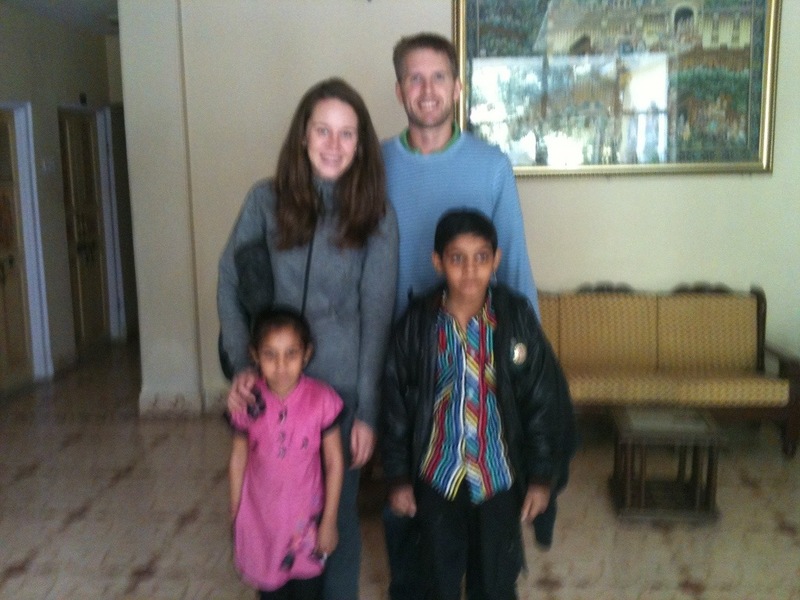 Our new adopted family Some adorable kids at our hotel who had never seen white people up close, and requested a photo. 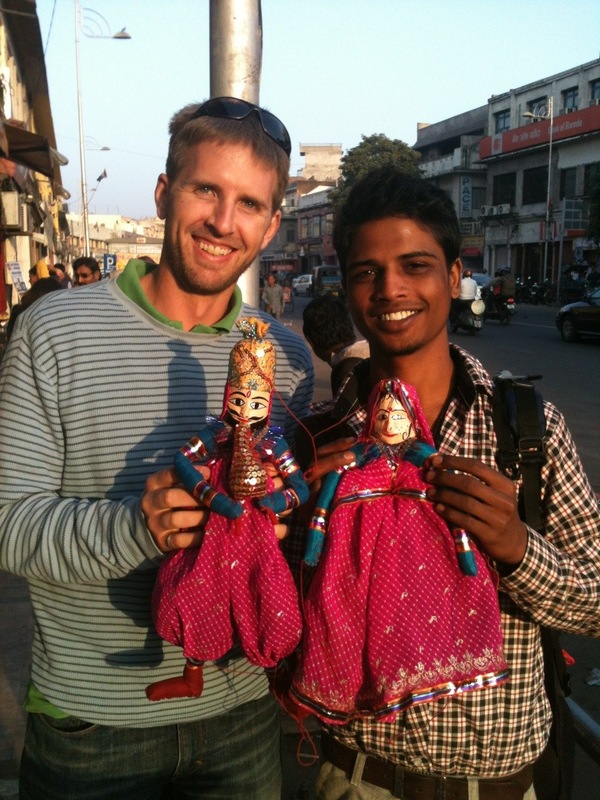 We also bumped into a young philosopher named Dinesh, who wanted to sell us a puppet. When we told him we weren’t interested, he settled for a conversation about the meaning of life. We chatted for awhile while I drank multiple lassis from a street vendor. When we had to leave, he gave us one of his puppets as a gift. I promised to write about him on my blog. There may have been some secret hand holding in this photo. Not sure. Speaking of puppets, we were also treated to a puppet show by a few young doofuses at our hotel. It included a Michael Jackson puppet with amazing dance moves who sang a Frere Jacques/Macarena medley. For this rare privilege, they allowed us to pay as much as we wished. Todd paid them more than I wished. 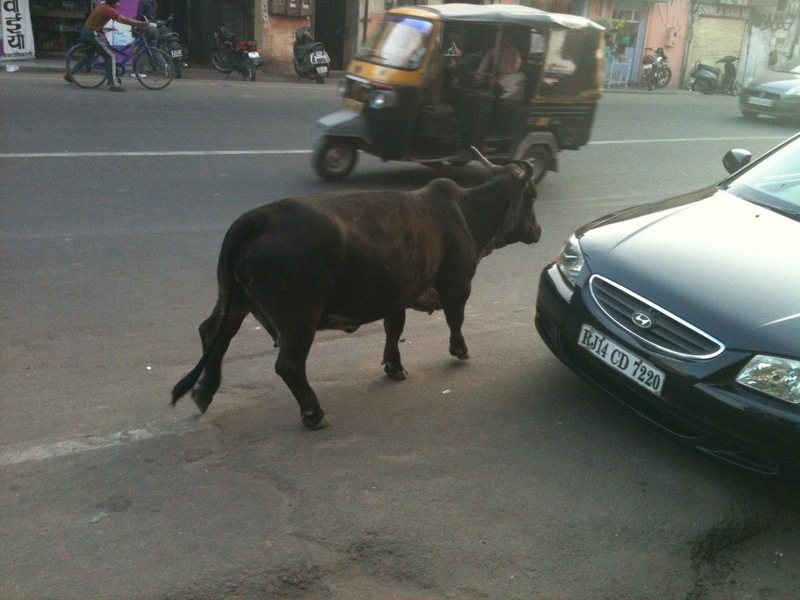 And finally, this fun li’l cow. Its body was a normal size, but it had dwarf legs. I may have laughed really hard and followed it for a block. What a gem. I left Jaipur unscathed, and with my bruised love for India mended.